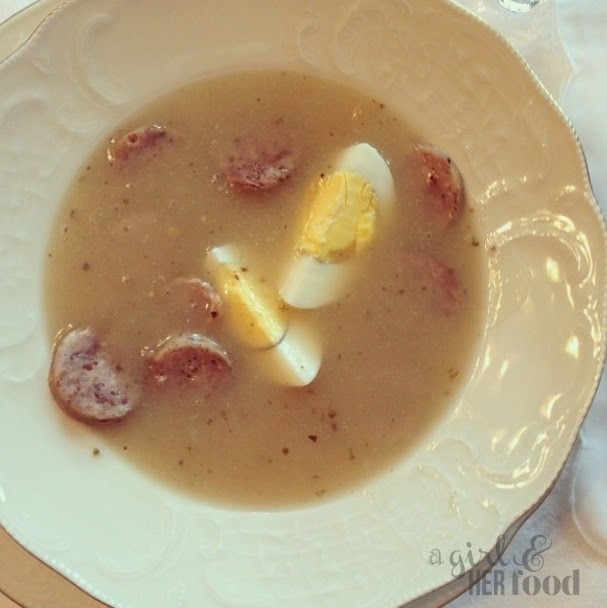 Zurek (pronounced 'zhurek") or zur is a Polish soup served traditionally at Easter. A distinctive feature of this soup is its sour taste. While most soups are derived from a meat or vegetable broth, the base of zurek is zawkas. Zakwas is super easy to make using rye bread and water, and you can also find it at most Eurporean market stores. Many of my non-Polish friends say it's the best soup they have ever had. A wonderful combination of sour, salt and a very appealing creamy texture. The Easter version always contains biala kilebasa or spicy white sausage, a hard boiled egg and freshly grated horseradish. Mix together rye flour, garlic, and crust with lukewarm water. Place all the ingredients in a large storage jar about 1 qt. Think of what you would use to preserve or for canning fruit. Place the in a warm place, like your windowsill or cupboard, for 5 days. Open the jar and remove any mold from the top and strain. The strained liquid is zakwas. Set aside. In a large soup pot, bring soup vegetables and water to a boil. Reduce heat and simmer 40 minutes uncovered. Strain the broth and discard the vegetables. Meanwhile, in a soup pot, cook the sausage, bacon, onion and garlic over medium high heat until lightly browned. Add the strained broth, bay leaf, marjoram, peppercorns, potatoes (optional) and horseradish. Bring to boil, reduce heat, and cook for about 20 mins. Stir in zakwas and bring to a boil. Remove the bay leaf and serve with a sliced hard boiled egg and freshly grated horseradish.